Who doesn’t know the popular UK tv show “Who want to be a Millionaire”? The tv show became very popular in the UK and in a short matter of time the show became a worldwide fenomen. The show was first introduced in 1988 and it ran until 2014. Over time, the show had been licensed to more than dozen countries all over the world. For the ones who never heard of the show, you have different candidates who need to answer 15 multiple choice questions and with every right answer the players climb up to get bigger cash prizes. When the candidates answered all the questions right and also the last question, the candidate will be rewarded with 1.000.000 pounds! Along the way, the candidates can make use of three lifelines: the 50/50, phone a friend and ask the audience. They can only use all of them once, when they are stuck with a question these can be very helpful. All candidates can choose after each question if they want to continue or stop and walk away with the money they earned so far. Ever since the news came out that Big Time Gaming was going to create the WWTBAM slot machine, everyone got excited and curious what the slot machine would look like. BTG has been the lucky one who got a deal with the owners and they agreed on letting them create the slot and make it an another success! The WWTBAM is a non-progressive slot machine and this would be the first slot to produce millionaires, doesn’t this sound really exciting?! The slot has different symbols, let’s start with the scatter. The WWTBAM logo has been used as the scatter symbol. When 3 scatter symbols appear you will be awarded with eight free games. Each game/gamble will be displayed the same as in the original Who Wants To Be A Millionaire show along with the lifelines. Who Wants to be a Millionaire Megaways slot is launching exclusively on the 15th of November to LeoVegas casino for the first two weeks! This means you can only play the slot machine at Leovegas between the 15th and the 28th of November of 2018. 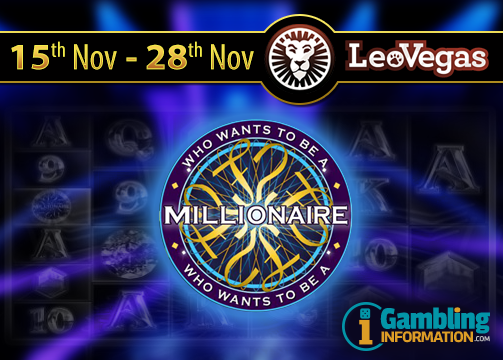 Don’t hesitate and visit LeoVegas and become the first WWTBAM Millionaire! For more information about LeoVegas, read our Leovegas casino review here.